Spielberg directed the film from a screenplay by Zak Penn and Ernest Cline. The film was produced by Donald De Line, Spielberg, Kristie Macosko Krieger and Dan Farah; with Adam Somner, Daniel Lupi, Chris DeFaria and Bruce Berman serving as executive producers. 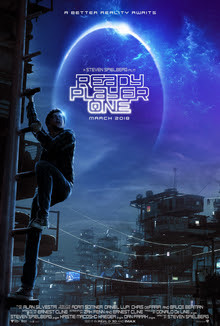 “Ready Player One” stars Tye Sheridan (“X-Men: Apocalypse,” “Mud”), Olivia Cooke (“Me and Earl and the Dying Girl,” “Bates Motel”), Ben Mendelsohn (“Rogue One – A Star Wars Story,” “Bloodline”) and T.J. Miller (“Deadpool,” “Silicon Valley”), with Simon Pegg (the “Star Trek” movies, the “Mission: Impossible” movies) and Oscar winner Mark Rylance (“Bridge of Spies,” upcoming “Dunkirk”).